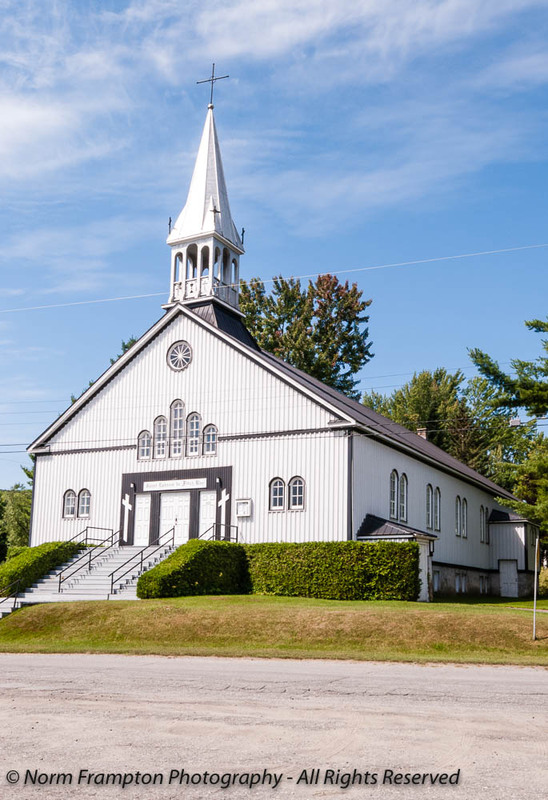 Continuing on my recent Eastern Townships theme here is a selection of quaint country churches from the same region. Église Saint-Ephrem de Fitch Bay in Stanstead County was a bit of an enigma in that I wasn’t able to find anything out about the place anywhere on-line. Though much smaller, Stanstead South United (former Congregationalist) Church was easy to research. 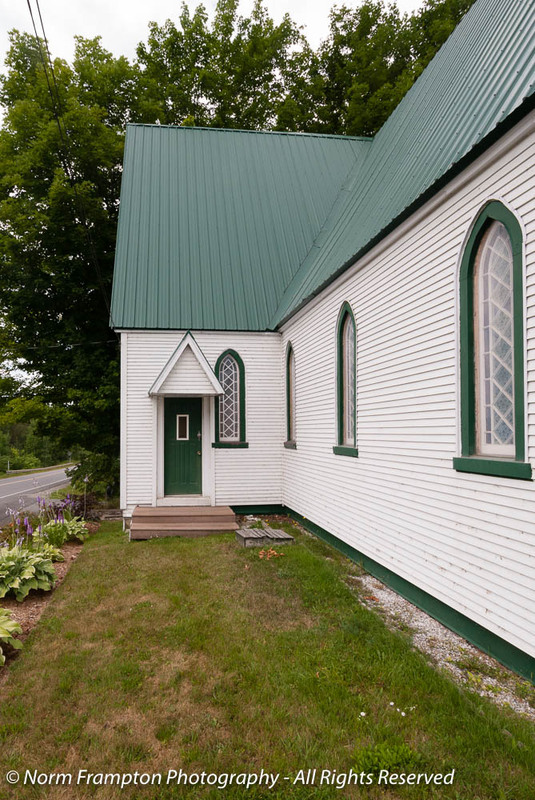 The current structure was built in 1876 as a Congregationalist church, but the congregation at this site actually goes back as far as 1810. During that time it has always had an international character, attracting members from both Quebec and Vermont; with the U.S. border within sight of the building. In fact during the war of 1812 the faithful from both sides attended services performed by a Vermont Pastor. Frankly I’m still trying to wrap my head around the concept that people at war with each other could stop to pray together…but times were different back then I guess. 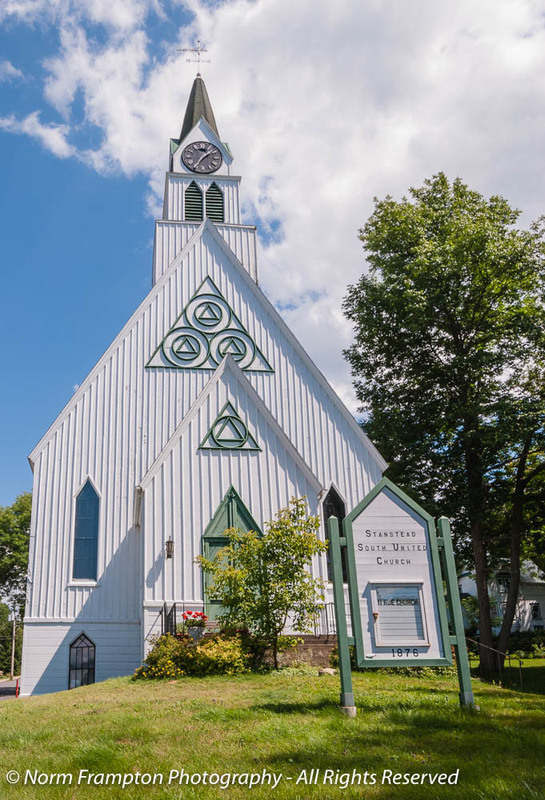 The current wooden structure was built in the Gothic Revival style with a steep clock tower and roof line, and triangular motifs (symbolizing the Holy Trinity) that repeat throughout the building. 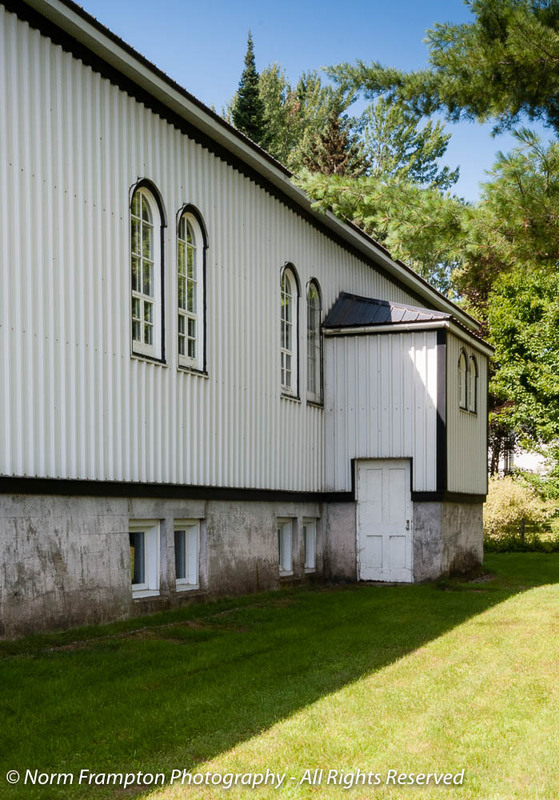 It seems that the building was sold in the spring of 2016 but when we were there in the summer we saw no signs that led us to believe the church was not still active. 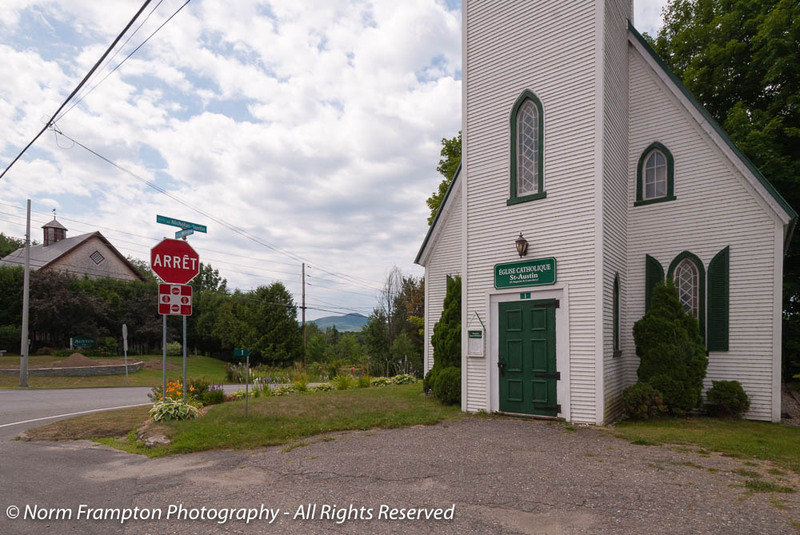 Église Catholique de St-Austin in the small community of Austin was another one that was difficult to find info about. 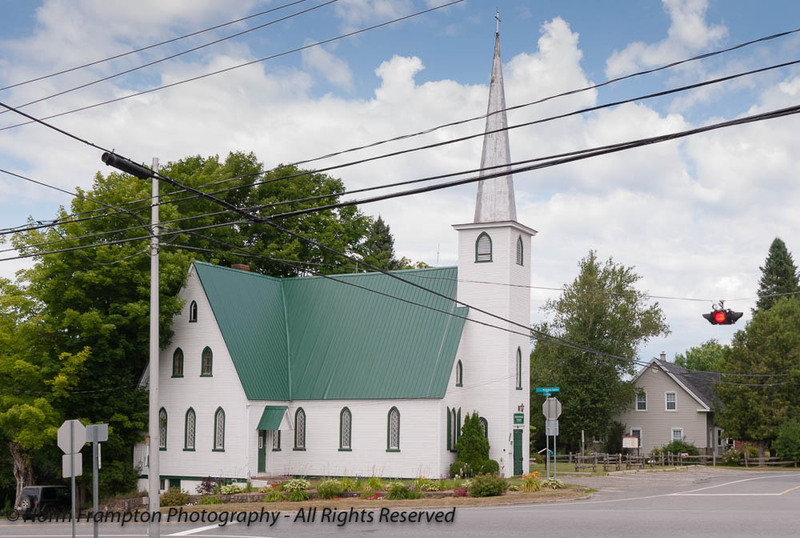 I guess when the year-round population of the town is only about 1,800 and doubles during the summer season, historical record-keeping about places of worship is kinda secondary. 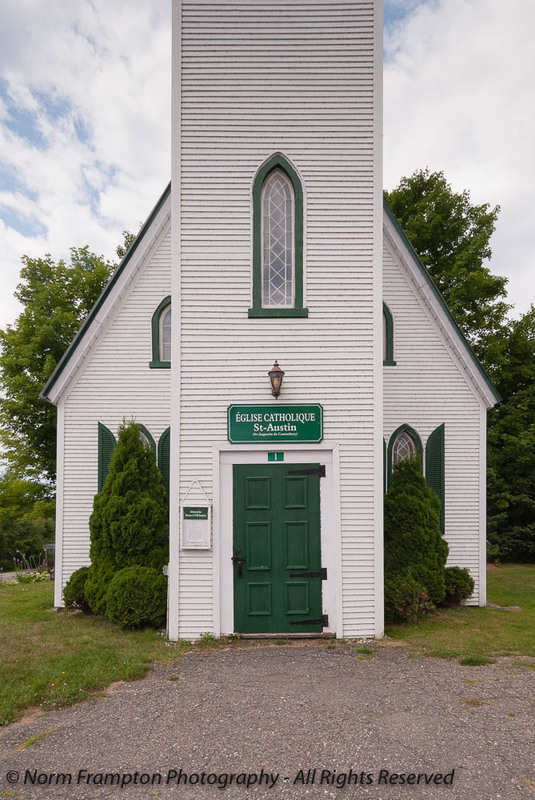 Gallery | This entry was posted in Photography, Thursday Doors and tagged Austin, Cantons de L'Est, Church, Doors, Eastern Townships, Eglise Saint-Ephrem, Fitch Bay, Magog, Québec, Standstead, Thursday Doors, Tourism, Travel. Bookmark the permalink. That is one of the most unusual churches I’ve seen so far, Norm. It definitely doesn’t look its age. I love the green shutters, they look like angel’s wings. So much green, but such a lovely shade (particularly with the white). Each is beautiful, and unique! I love the last one with the green trim, and doors. Thanks Deborah. 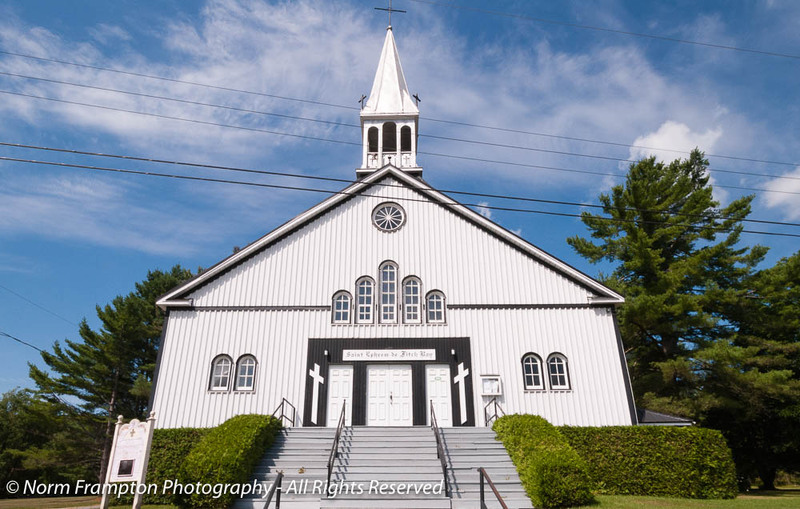 These cute little country churches make a nice change from the huge cathedrals that we see. Lovely churches, so fresh too with the white and trim, the doors fit so well with the designs of each building.. They are all so steeply angled…is it an area trait? Each of these churches has beauty and Grace. 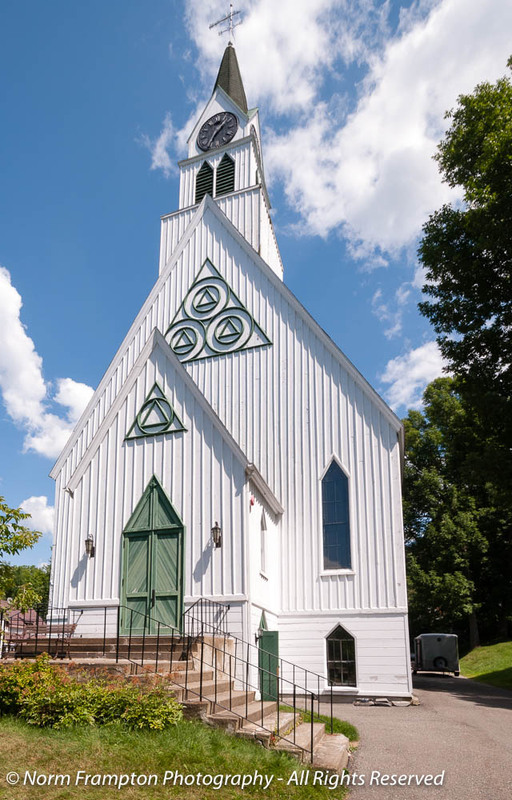 I like green details in the trim on one, the beautiful wispy clouds in a pretty blue sky and the last church is my favorite! Stanstead South is a striking church. Between the stark green and white paint and the geometric embelishments it really stands out to me. A very interesting structure, too bad no longer in service to its community. thanks for the history and I like the feel of the clean lines and the green on white – and the triangle topped doors are so unique. I really enjoyed this post. There are two small churches that I know of around here. I must check into them to see how long they have been standing. I’m inspired! Thanks. Thanks – I’m glad you enjoyed it. Checking out local history can be so much fun, especially because it’s so much easier to make a personal connection when it’s local. I love those churches. Those triangle doors and windows are unique. Even I’m not a fan of green, I like those green doors too. Love this post so interesting, call three churches are beautiful! The history of the middle church where both confederates and the Unionists prayed together. It would not happen today would it. Yet on the first Christmas of WW1 the Germans and English came out of their trenches and celebrated Christmas then returned to to their trenches and war.that never happened again… Ever. Here is a Cadbury’s chocolate advert, it may be an advert but it tells the story well. It’s always nice to see these beautiful churches from your doorscursions, Norm. I never tire of them. These are beautiful! Thanks for sharing and hope you find time to take a special door trip with your camera. Thanks – glad you liked them. I went i and removed last week’s post from this week’s list. For future reference, you should be able to delete your own posts from the list. Beautiful churches! I especially love the understated quality of the last one… I wonder what’s inside? I think I may have inadvertently managed to link to your site, Norm, with more Delhi doors. Your perpendicular gothic style churches are wonderful, or should I say, magnifique? 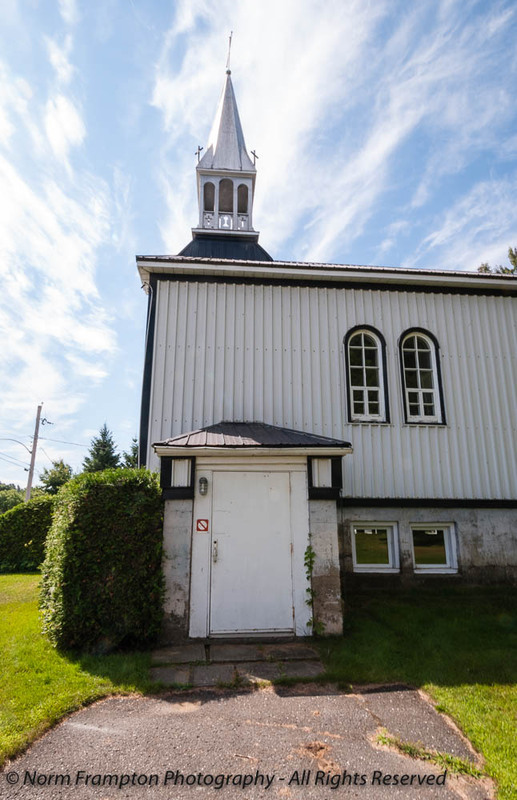 Thanks for sharing a bit of the history of that United, formerly Congregationalist church. I’m not so surprised that they prayed and worshiped together during the war of 1812, since Jesus taught us to love our enemies and pray for those who persecute you. Who knows, perhaps God answered their prayers and helped put a relatively quick end to that war, so as to preserve as many lives as possible, given the circumstances. I guess I see it differently. I mean, isn’t the first commandment of the Christian faith, “Though Shalt Not Kill”? The first church is so bold and the second, so detailed, and the third is downright charming! Love all the green doors! I will reserve my commentary on The War of 1812, as I find it all too hard to understand — the fighting part, not the peaceful worship part. Thanks Joey. I have a whole list of places I want to check out for serious door potential but finding the time and getting the right weather conditions has been difficult lately. I love the green doors. Especially the picture with the small and hidden side entrance. That is one pointy church, right there. These are both very elegant churches, but in a much more approachable or, perhaps, down-to-earth way than the awesome, towering stone edifices that I also love. I remember reading a number of times about how, in WWI in France on Christmas Eve, both sides stopped and celebrated Christmas through song and fraternizing. The next day, the war went on. I find it both bizarre and comforting. Thanks Janet. There really is something quaint and comforting about small country churches. White churches seem to be more prevalent on this side of the pond than at least in W. Europe. My favorite door is the first green door -unusual! As always a great and interesting post, Norm! Thanks. You’ll see white churches predominantly with wooden structures, I think. Beautiful churches and wonderful doors, Norm. I love those steeply pitched doors and roof lines. It is interesting about people from both sides of a battle worshiping together, but I guess war is always harder to understand at a local level. One thing that amazes me about the construction in churches like this, is the apparent precision in matching and duplicating angles and curves. When you consider the tools of the trade at the time, I think it’s quite an accomplishment. Thanks Dan. You’re right about the skill of the builders back then. It took quite a few years of apprenticeship to learn to master the tools and techniques. These folks were true craftsmen. 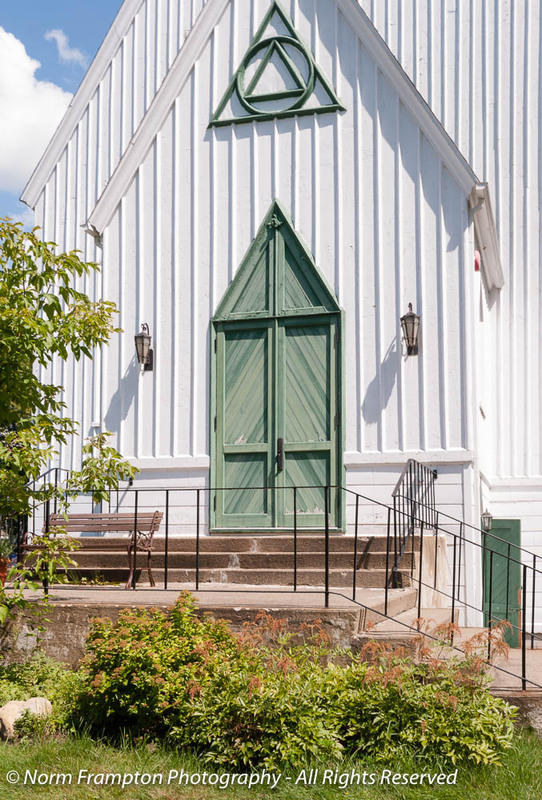 I really like the 2nd church – Stanstead South United – with the peaked green door. That is an unusual take on a simple wooden door. The circle and triangle motif throughout the design is also very different. Love it!